So, whose land is our land? Tags: Peter Hetherington, Shorts, Whose land is our land? 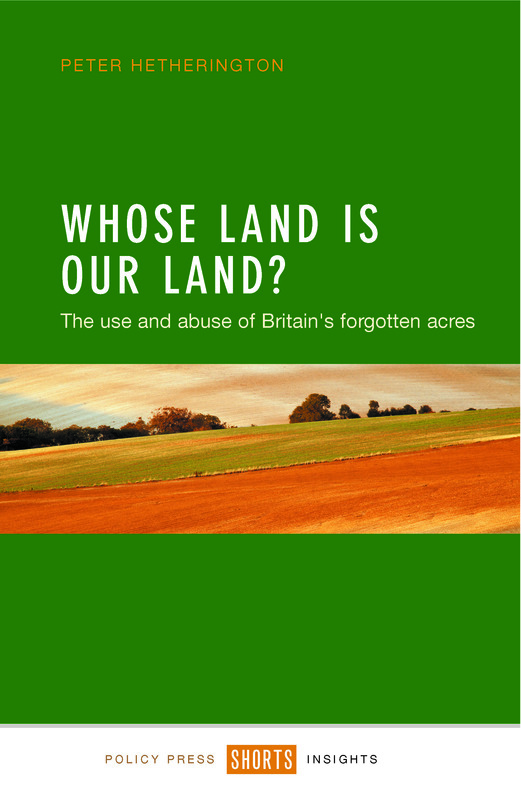 In today’s guest post Peter Hetherington, author of Whose Land is our Land?, explains why he believes reform of land ownership is necessary to mitigate the approaching challenges posed for food, energy and housing by climate change. People often assume that those like me who advocate land reform, no matter how minimal, must be on one side of the political fence. Calling for measures to clamp down on speculation driven by tax avoidance seems to only reinforce a belief by some that us moderates are quasi‐revolutionaries conspiring to end ownership as the establishment knows it – be they the old landed class or the newer rich seeking to offload spare millions. Of course the spokesman was right to suggest that of the – say – 100,000‐plus acres of agricultural land sold annually in England only a small proportion involves the super rich seeking a safe, recession‐proof haven for their spare millions. However prices, according to land agents Savills, have risen by a staggering 277% in a decade, making agricultural land a much safer investment bet than prime central London property and gold. One driver is that agricultural land offers generous breaks on inheritance and capital gains tax: it is exempt from the former after two years, for instance, if it is actively farmed. get on the farming ladder. I’ve been investigating issues around this land of ours for my book, ‘Whose Land is Our Land’. I’ve explored ownership and the old, landed rich through to the challenges of farming – with self‐sufficiency in the foods we are capable of growing falling when it could (and should) be rising. I’ve looked at issues such as housing the nation, in the face of a ‘shadow’ unregistered market in which potential building land is being effectively rationed. I’ve asked searching questions about our ill‐preparedness for addressing rising sea levels, induced by climate change, in our most productive farming area, the east of England. Various agencies, including the National Audit Office, warn that we face tough choices: either raising our flood defence investment, or abandoning big tracts of land. One advantage of coming to this issue as a journalist – let’s be blunt, a ‘hack’ – and not as an academic is that, after interviewing scores of people (individual and institutional landowners, farmers, tenants, politicians) pre‐conceived ideas sometimes go to the wall. Thus, public or charitable ownership equals ‘good’ and private ownership equals ‘bad’ is a gross over‐simplification. It so happens that the second largest landowner (and largest tenant farming landlord) , the National Trust, has been embroiled in a dispute with its tenants (and the Tenant the Farmers’ Association) more associated with private landlordism. There are, in short, good, bad, indifferent owners in all camps. Ownership, in short, is no determinant of either progressive land use or tenure. So the good private landlord, progressively farming, has to be balanced against another owner who assumes that what is beneficial for the family firm is automatically good for the surrounding community. Generalisation can be dangerous. Inevitably as a messenger, rather than a polemicist – and not a farming journalist – I have naturally relied on the help and guidance of others. Philip Lowe, professor of rural economy at Newcastle University, proved invaluable. His argument for modest reform, involving farmers and landowners abiding by a charter setting out rights and responsibilities to ensure the better use of all land proved compelling – particular after one expert in Norfolk (farmer of the year in 2014) spoke of his concern about slack practices on land farmed by contractors on behalf of the new rich. And, so, back to tax. On the basis of my investigations I believe that we are approaching a collision of extremes ‐ increasing demand for food, energy, water and housing – when we should be adapting to, and hopefully mitigating, the impact of climate change on that most basic resource: our land. Sadly, our approach as a nation, through successive governments, is piecemeal and short term. In truth, England needs an active land policy to address feeding, watering and housing the nation. In November I’m off to the Scottish Parliament, for an informal event based on my book, facilitated by the chair of its rural affairs committee. In Scotland reform is high on the Scottish Government’s agenda. It wants the power to intervene if the scale of ownership, and the conduct of a landowner, is seen as a “barrier to sustainable development.” And in England? I’ve just been to the annual conference of the governing party to try to find out. Whose land is our land? is available to purchase here from the Policy Press website. Remember that Policy Press newsletter subscribers receive a 35% discount – if you’re not a member of our community why not sign up here today? Henry George gave us the answer to this problem an age ago: Lloyd George and Churchill knew it but who now takes heed?